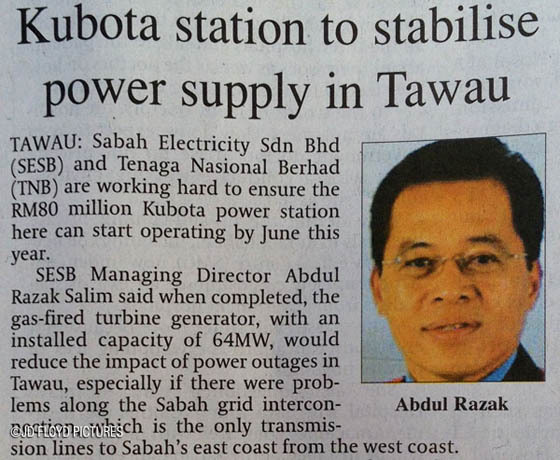 The total blackout on 30 April 2012 is just one of the many power outages that Malaysians in Sabah have to endure. One of the many unresolved reasons for the frequent power supply interruption is the inadequate power generated by the utility. Almost immediately after the massive blackout, SESB announced that, together with Tenaga Nasional Berhad (TNB), it is working hard to ensure the RM80 million Kubota power station in Tawau can start operating by June this year. The RM80 mil project consists of gas-fired turbine generator, with an installed capacity of 64MW and is expected to reduce the impact of power outages in Tawau especially if there were problems along the Sabah grid interconnection. 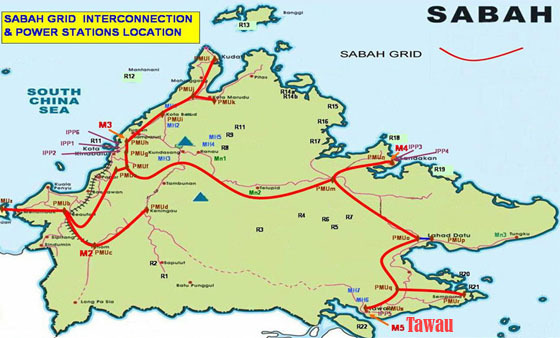 Note that this interconnection is the only east-wast transmission lines that transmit power from west coast to Sandakan, Tawau, Lahad Datu and the whole of the east coast. As such, apart from higher generating capacity, this east-west grid is of tremendous importance to SESB, financially as well as keeping its reputation intact. Something's not right? The headline is correct about the 64MW plant. The person in the pic is Ir. Baharin Din. Not Abdul Razak! Peak demand/load for Tawau at the moment is 80MW and is expected to increase to 96MW by 2015. Compared with the current generating capacity of only 64MW, the town and its surroundings are in constant dependance of 'imported' power from west coast. SESB said that the east coast is importing between 16MW and 164MW of power from the west coast daily. This will be another challenge for the power utility to juggle between the two coasts. Old equipments and transmission lines certainly add to the possibility of frequent power disruptions. It is not that importing power from the West Coast is a bad idea. But with its operations put to the higher limit, SESB is risking recurrence of major power failures as the supply become unstable with the safety margin being 'sucked' by the importing power network (in this case the East Coast). Can we still get the power by June? With the recent news saying that one of the barges containing equipment for the Kubota power plant has been hijacked by pirates, we are now less optimistic about the June deadline. 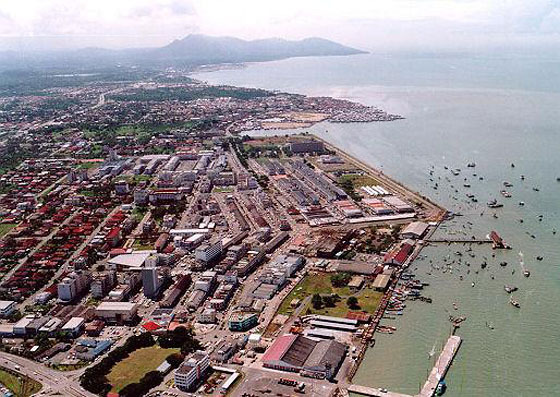 It was reported that only one shipment, Wantas, reached Tawau port in mid-May while the other barge, Wantas VII that was ferrying equipment including a gas turbine generator belonging to TNB-SESB was hijacked by pirates sometime mid-April. It seems that the wait for more stable power supply is on, at least for now. End of the year seems more like it but I'm happy to be proven wrong! It seemed to be belonged to olden days, hard to believe we are still facing them nowadays.